Combine a visit to the Tulum ruins with an ATV ride and snorkeling in an underground river during this 7-hour trip from Riviera Maya. Lunch buffet and round-trip hotel transportation included. Optional collision insurance avaiable for $15 USD. Be ready for convenient pickup bright and early at your hotel in Riviera Maya, around 7am. Climb into a comfortable tour vehicle and head straight for the area's most important archaeological site, the Tulum ruins. Once you arrive, embark on a guided tour that hits all the highlights of the important Mayan site. You'll also have the opportunity to explore further on your own after the tour's conclusion. 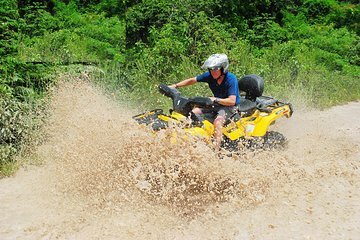 Move on for the next phase of your adventure: an ATV ride through the Mayan jungle. Keep an eye out for local flora and fauna on the way to the snorkeling site, where you can swim in an underground river among unique rock formations. Refuel with a traditional Mexican buffet lunch, including grilled meats, salad, beans, rice, and chips, accompanied by soft drinks and mineral water. Drop-off back at your hotel concludes your tour. Prescription goggles available under previous request. This tour is not suitable for people with severe physical or motor handicap, serious heart problems, pregnant women or people who are not able to handle moderate physical activity. Bring along: Comfortable clothes and footwear, water shoes, sunglasses and hat, bathing suit, extra T-shirt, towel, only biodegradable sunscreen and mosquito repellent, cash (pictures, souvenirs, tips and extra insurance). We did a bachelor party for this event and it was the perfect amount of time and experience/interaction. We had a blast and would definitely recommend it. This tour was great. Our driver Flavio picked us up at the hotel and then he was with us all day. He made sure we were okay and having a great time. ATV, our guide was Flavio and Herlan. Both men were very helpful. Then when we got to Tulum Ruins, our guide Ernesto was very informative. My cousins and I had a great time. Thanks guys! Was an amazing time for both my son, who is 11, and myself. Tulum was beautiful, and our tour guide was very informative. After that, was the snorkeling and ATV's which was a blast!! We were in a small group which made the experience even more enjoyable!